Footwear exports in the first quarter of this year jumped 19.5% to an estimated value of US$2.5 billion, the highest growth over the last two years, according to the Vietnam Leather, Footwear and Handbag Association (Lefaso). A series of free trade agreements (FTAs), including the Trans-Pacific Partnership (TPP) and the EU - Vietnam FTA, which soon come into effect will create a motive to attract more investment from foreign and domestic businesses. 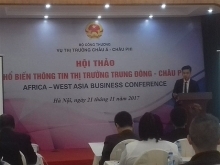 Lefaso Vice President Diep Thanh Kiet revealed that many footwear businesses have concluded export contracts for the third quarter, even for the fourth quarter of this year. Exports prices to major markets like the US, Japan, Australia, and South America remain stable. However, prices of some renowned brand names have surged slightly as importers took account of recent minimum wage hike in Vietnam. Export businesses are facing difficulties in the EU market due to the devaluation of the Euro. Importers have asked them to lower the price in case they signed a contract in US dollar.